Schumer has spoken out against Kavanaugh's nomination to the Supreme Court. 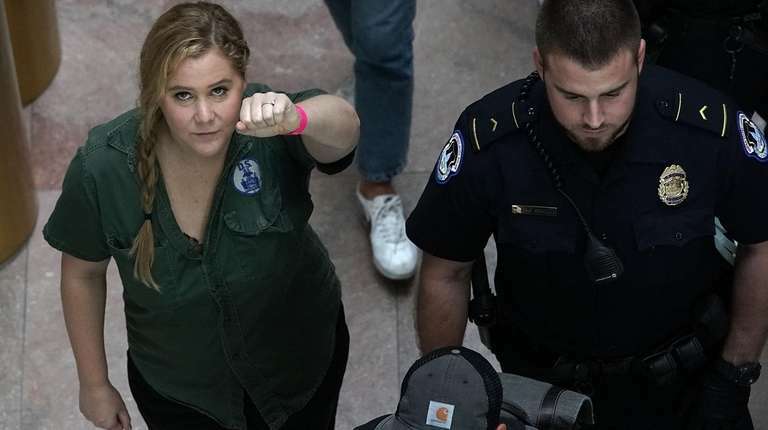 Comedian and actress Amy Schumer was arrested on Capitol Hill Thursday during a protest against Supreme Court nominee Brett Kavanaugh, the Washington Post reported. Schumer, 37, was among hundreds protesting at the Hart Senate Office Building on Thursday, the same day an FBI report on sexual assault allegations against Kavanaugh was being reviewed by senators. Videos posted on Twitter show Schumer, the cousin of Sen. Chuck Schumer (D-NY), in a long line of protesters being led away from the protest by several officers. Capitol Hill police declined to confirm the names of people arrested, saying they were processing the arrests of 293 people who were allegedly unlawfully demonstrating in the atrium of the Hart Building. All were charged with violating local law against crowding and obstructing, police said. Amy Schumer has been vocal against Kavanaugh's nomination. The Hill, a Capitol Hill media outlet, posted video of her speech at the protest. "No matter how this goes, they cannot keep us down," she said. "A vote for Kavanaugh is a vote saying women don't matter." Schumer's attorney declined to comment. Her publicist did not return calls for comment. Model and actress Emily Ratajkowski was also at the protest and tweeted at 5 p.m. that she had been arrested.